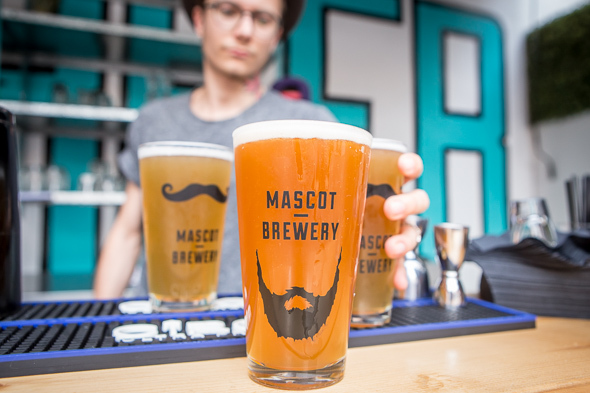 Mascot Brewery and Beer Garden occupies the rooftop above Odd Thomas on Mercer St. 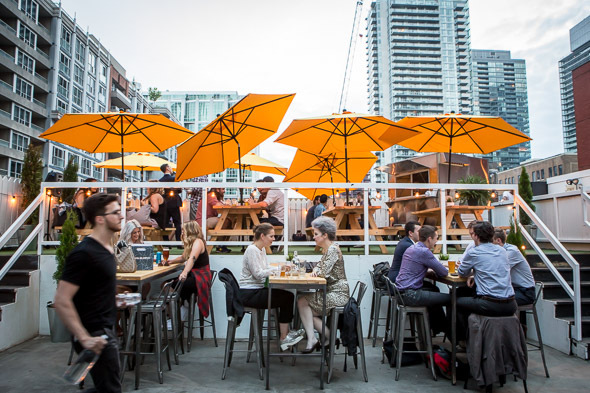 It's positioned perfectly to attract condo dwellers, Jays fans and clubs goers, but unlike its chic neighbours (including Hotel Germain and Buonanotte ), this place (formerly The Cove/Gilt/Bauhaus) boasts a casual come-as-you-are kind of vibe. 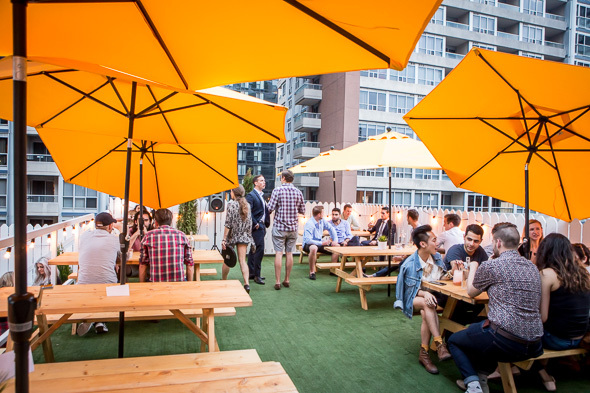 Decked out with picnic tables, yellow umbrellas, astroturf, and white picket fences, the 200-seat patio replicates the best parts of a backyard barbecue, only better thanks to the elevated view and a well-stocked bar. Currently, the place contracts brewing to Duggan's, though the intent is to move operations on site before the end of summer. For now only two of the taps, a Pilsner and a Hefeweizen, are their own (sold for $8 per pint), which are joined by other local craft selections including an eclectic variety in tallboys ($7-$8) and bottles ($7). Large parties can tap five litre kegs ($130) right at their table as alternative to bottle service - a program that's the first of its kind in Toronto. 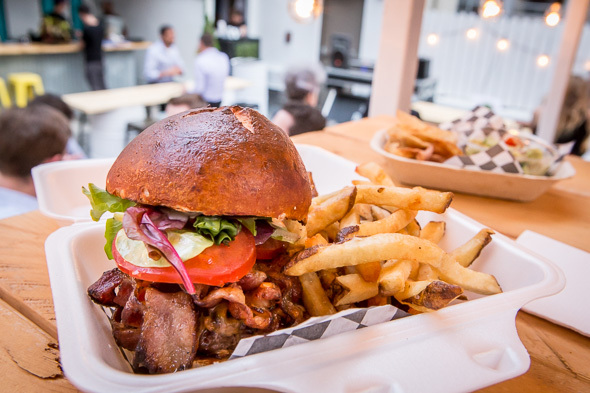 The food menu from Rory McGouran (ex- 416 Snack Bar ) embraces the backyard BBQ theme, while also nodding to Bavarian influences. It's all scratch-made, cooked primarily on an open grill then served in disposable containers through the window of a food cart parked in the corner. 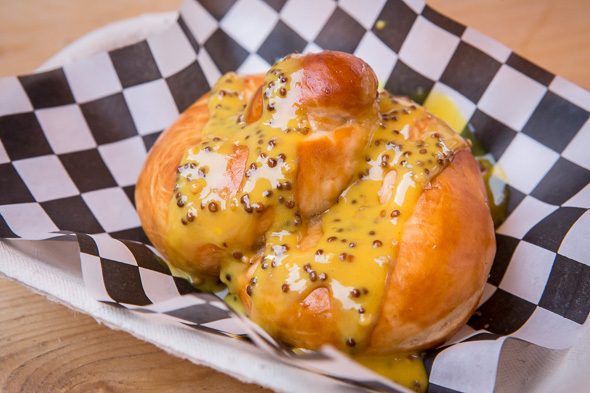 There's beer friendly snack foods like the Mascot Pretzel ($5), chewy baked goodness smothered in sweet house-made mustard and dusted in smoked maldon. 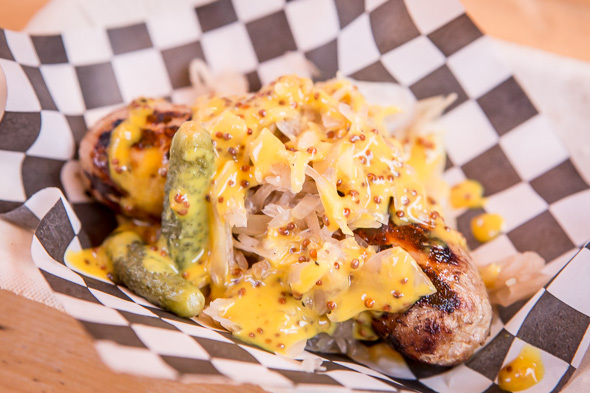 Then there's a pork and veal bratwurst ($6), poached in Mascot Pilsner then finished on the grill and dressed in mustard and tangy sauerkraut. More substantial is the house cheeseburger ($14) featuring a ground brisket patty loaded onto a pretzel bun with double smoked bacon and onion aioli. It comes with fries and is an entirely satisfying combo. On the lighter side, there's oysters (MP), a grilled asparagus salad ($7), and, an albacore tuna ceviche ($9) served with taro chips. Given it's a list of just eight dishes, it's an appreciatively balanced selection. On Sundays, there's brunch from 11am on, but otherwise the patio operates afternoons until whenever business declines. Mascot is entirely fitting name for this place. 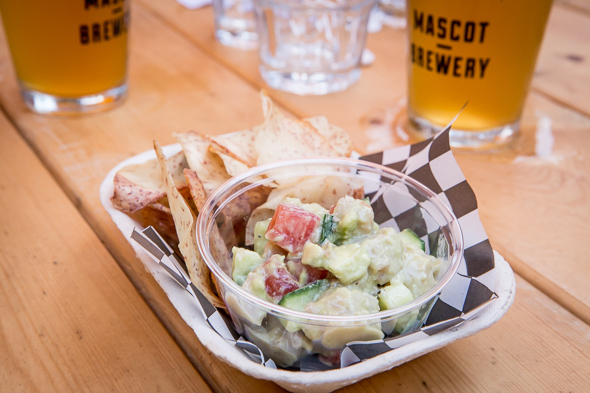 Its proximity to Rogers Centre and on point menu are going to make this place a champion for pre- and post-game drinking.